Achterzijde A portrait of St. George the Dragon slayer. 10 oz 2019 Royal Mint Valiant Silver Coin Enjoy the lowest price on the internet, when you order your 10 oz 2019 Royal Mint Valiant silver coin from our online shop now! 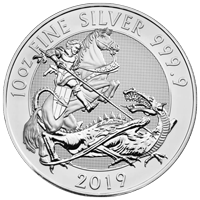 This coin marks the second dazzling release in the Valiant series by Britain's renowned Royal Mint; the first in the series appeared in 2018. The reverse of this showstopper features an artful rendering of St. George slaying the dragon from the back of his trusty steed; this detailed feature is set against a light catching field of micro-engraved texturing. Also on the reverse, details of metal content, weight and purity, as well as the coin’s year of issue, all set within a wide, clear border. The obverse feature is a majestic rendering of Elizabeth II in profile, depicted wearing her magnificent State Diadem and also set against a dazzling, micro-engraved field. Also on the obverse, the coin’s denominational value and Elizabeth II’s regal title. The reverse design, by Etienne Milner, is based on a more rugged, classic rendering by artist, Pistrucci. Enjoy this sharpened look at a classic legend and fortify your holdings with a 10 oz 2019 Royal Mint Valiant silver coin today.